I had shared my take on a possible Apple Biometric solution during the Jan of this year based on its Authentec acquisition. I came pretty close, except for the suggestion that NFC is likely to be included. Sigh. Its a bit early to play fast and loose with Apple predictions, but its Authentec acquisition should rear its head sometime in the near future (2013 – considering Apple’s manufacturing lead times), that a biometric solution packaged neatly with an NFC chip and secure element could address three factors that has held back customer adoption of biometrics: Ubiquity of readers, Issues around secure local storage and retrieval of biometric data, Standardization in accessing and communicating said data. An on-chip secure solution to store biometric data – in the phone’s secure element can address qualms around a central database of biometric data open to all sorts of malicious attacks. Standard methods to store and retrieve credentials stored in the SE will apply here as well. Why didn’t Apple open up Touch ID to third party dev? Apple expects a short bumpy climb ahead for Touch ID before it stabilizes, as early users begin to use it. By keeping its use limited to authenticating to the device, and to iTunes – it can tightly control the potential issues as they arise. If Touch ID launched with third party apps and were buggy, it’s likely that customers will be confused where to report issues and who to blame. That’s not to say that it won’t open up Touch ID outside of Apple. I believe it will provide fettered access based on the type of app and the type of action that follows user authentication. Banking, Payment, Productivity, Social sharing and Shopping apps should come first. Your fart apps? Probably never. Apple could also allow users to set their preferences (for app categories, based on user’s current location etc.) such that biometrics is how one authenticates for transactions with risk vs not requiring it. If you are at home and buying an app for a buck – don’t ask to authenticate. But if you were initiating a money transfer – then you would. Even better – pair biometrics with your pin for better security. Chip and Pin? So passé. It won’t be long before an iPad shows up in the wild sporting Touch ID. And with Blackberry’s much awaited and celebrated demise in the enterprise, Apple will be waiting on the sidelines – now with capabilities that allow digital signatures to become ubiquitous and simple – on email, contracts or anything worth putting a signature on. Apple has already made its iWork productivity apps(Pages, Numbers, Keynote), iMovie and iPhoto free for new iOS devices activated w/ iOS7. Apple, with a core fan base that includes photographers, designers and other creative types, can now further enable iPads and iPhones to become content creation devices, with the ability to attribute any digital content back to its creator by a set of biometric keys. Imagine a new way to digitally create and sign content, to freely share, without worrying about attribution. Further Apple’s existing DRM frameworks are strengthened with the ability to tag digital content that you download with your own set of biometric keys. Forget disallowing sharing content – Apple now has a way to create a secondary marketplace for its customers to resell or loan digital content, and drive incremental revenue for itself and content owners. In a day and age where we forego the device for storing credentials – whether it be due to convenience or ease of implementation – Apple opted for an on-device answer for where to store user’s biometric keys. There is a reason why it opted to do so – other than the obvious brouhaha that would have resulted if it chose to store these keys on the cloud. Keys inside the device. Signed content on the cloud. Best of both worlds. Biometric keys need to be held locally, so that authentication requires no roundtrip and therefore imposes no latency. Apple would have chosen local storage (ARM’s SecurCore) as a matter of customer experience, and what would happen if the customer was out-of-pocket with no internet access. There is also the obvious question that a centralized biometric keystore will be on the crosshairs of every malicious entity. By decentralizing it, Apple made it infinitely more difficult to scale an attack or potential vulnerability. 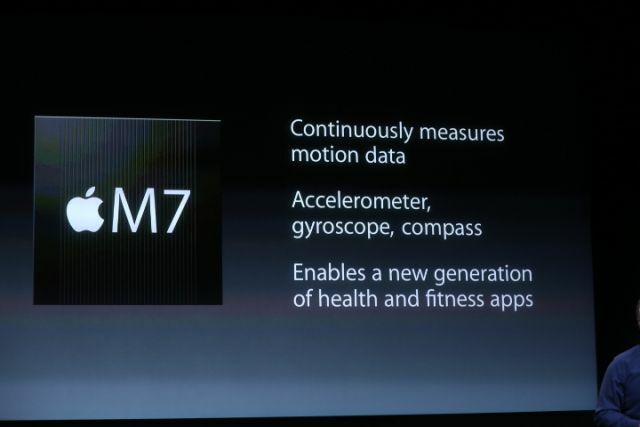 More than the A7, the trojan in Apple’s announcement was the M7 chip – referred to as the motion co-processor. I believe the M7 chip does more than just measuring motion data. M7 – A security co-processor? 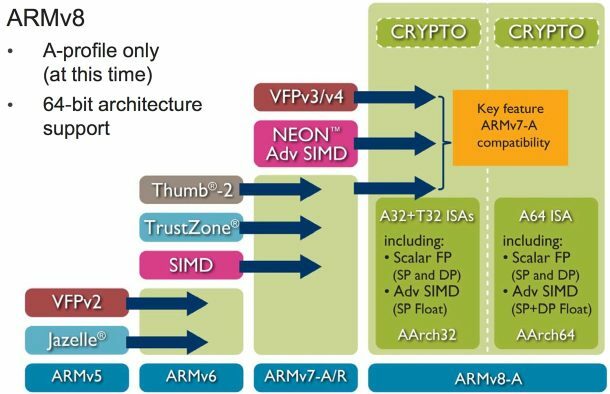 I am positing that Apple is using ARM’s TrustZone foundation and it may be using the A7 or the new M7 co-processor for storing these keys and handling the secure backend processing required. Horace Dediu of Asymco had called to question why Apple had opted for M7 and suggested that it may have a yet un-stated use. I believe M7 is not just a motion co-processor, it is also a security co-processor. I am guessing M7 is based on the Cortex-M series processors and offloads much of this secure backend logic from the primary A7 processor and it may be that the keys themselves are likely to be stored here on M7. The Cortex-M4 chip has capabilities that sound very similar to what Apple announced around M7 – such as very low power chip, that is built to integrate sensor output and wake up only when something interesting happens. We should know soon. This type of combo – splitting functions to be offloaded to different cores, allows each cores to focus on the function that it’s supposed to performed. I suspect Android will not be far behind in its adoption, where each core focuses on one or more specific layers of the Android software stack. Back at Google I/O 2013, it had announced 3 new APIs (the Fused location provider) that enables location tracking without the traditional heavy battery consumption. Looks to me that Android decoupled it so that we will see processor cores that focus on these functions specifically – soon. I am fairly confident that Apple has opted for ARM’s Trustzone/TEE. Implementation details of the Trustzone are proprietary and therefore not public. Apple could have made revisions to the A7 chip spec and could have co-opted its own. But using the Trustzone/TEE and SecurCore allows Apple to adopt existing standards around accessing and communicating biometric data. Apple is fully aware of the need to mature iOS as a trusted enterprise computing platform – to address the lack of low-end x86 devices that has a hardware security platform tech. And this is a significant step towards that future. What does Touch ID mean to Payments? Apple plans for Touch ID kicks off with iTunes purchase authorizations. Beyond that, as iTunes continue to grow in to a media store behemoth – Touch ID has the potential to drive fraud risk down for Apple – and to further allow it to drive down risk as it batches up payment transactions to reduce interchange exposure. It’s quite likely that à la Walmart, Apple has negotiated rate reductions – but now they can assume more risk on the front-end because they are able to vouch for the authenticity of these transactions. As they say – customer can longer claim the fifth on those late-night weekend drunken purchase binges. Along with payment aggregation, or via iTunes gift cards – Apple has now another mechanism to reduce its interchange and risk exposure. Now – imagine if Apple were to extend this capability beyond iTunes purchases – and allow app developers to process in-app purchases of physical goods or real-world experiences through iTunes in return for better blended rates? (instead of Paypal’s 4% + $0.30). Heck, Apple can opt for short-term lending if they are able to effectively answer the question of identity – as they can with Touch ID. It’s Paypal’s ‘Bill Me Later’ on steroids. Effectively, a company like Apple who has seriously toyed with the idea of a Software-SIM and a “real-time wireless provider marketplace” where carriers bid against each other to provide you voice, messaging and data access for the day – and your phone picks the most optimal carrier, how far is that notion from picking the cheapest rate across networks for funneling your payment transactions? Based on the level of authentication provided or other known attributes – such as merchant type, location, fraud risk, customer payment history – iTunes can select across a variety of payment options to pick the one that is optimal for the app developer and for itself. And finally, who had the most to lose with Apple’s Touch ID? 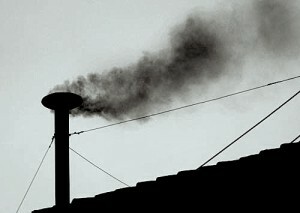 Does it mean that Carriers have no meaningful role to play in commerce? Au contraire. They do. But its around fraud and authentication. Its around Identity. … But they seem to be stuck imitating Google in figuring out a play at the front end of the purchase funnel, to become a consumer brand(Isis). The last thing they want to do is leave it to Apple to figure out the “Identity management” question, which the latter seems best equipped to answer by way of scale, the control it exerts in the ecosystem, its vertical integration strategy that allows it to fold in biometrics meaningfully in to its lineup, and to start with its own services to offer customer value. So there had to have been much ‘weeping and moaning and gnashing of the teeth’ on the Carrier fronts with this launch. Carriers have been so focused on carving out a place in payments, that they lost track of what’s important – that once you have solved authentication, payments is nothing but accounting. I didn’t say that. Ross Anderson of Kansas City Fed did. I don’t have a bloody clue. Maybe iPhone6? iPhone6S? U usually have a comment or 2 but you did such a comprehensive job I truly have nothing to add. At a macro level, security and authentication in consumer electronic devices will become a significant resource spend over the next 3 years. If Apple will become a consumer authentication service provider (a la Experian) on behalf of non-Apple services seems like overreaching. But, making Trust a selling consumer feature of devices is likely to be a permanent part of the conversation.